Herbs are ideal for container gardening. Most varieties of herbs do well in containers. You can plant a group of herbs with similar needs together in the same pot to save space and time. Make sure you choose herbs you enjoy when deciding what to grow in your garden. Picking a large enough container that has a drainage hole is also essential for the happiness of your herbs. Once planted, your herb garden will need plenty of sunlight and regular waterings to thrive. Step one of starting a herb container garden is choosing the herbs you want to grow in the garden. Although pretty much every type of herb can grow in a container, according to Bonnie Plants, some varieties play nicer with other varieties than others. For example, if you're going to grow all of your herbs in one big container, you want to make sure the plants have similar growing needs. If you plant a water-loving herb with one that likes drier soil, either one will be happy and the other not or both will be miserable. In this video from Learn to Grow, Marcella shows you how to plant a group of herbs together in a container. She explains her reasons for growing some herbs in one pot and a different group of herbs together in a different pot. Think of what you like to eat or drink when you choose your herbs. It doesn't make sense to grow tarragon or basil if you won't cook with either. If you regularly prepare lots of herbal tea, you might want to grow herbs that are good for steeping. A few varieties of mint, lemon verbena and chamomile can be perfect for a tea-focused container herb garden. Alternatively, you can choose a Mediterranean theme and plant herbs such as thyme, oregano and rosemary together. Since the herbs have similar needs and requirements, you can easily plant them in a single pot together. The video above from the University of Nebraska has a few more ideas for herbs to grow or herbs to grow together in a container, including some herbs you might not have thought about, such as kaffir lime. Although it's possible to grow a number of herbs from seed, if you are growing the plants in a container or group of containers, it might be best to start with small seedlings. That's particularly true if you're going to grow a number of perennial herbs, such as thyme, oregano, mint, and rosemary. Those varieties are very slow to get started from seed and you might find yourself running out of patience. If you start with a seedling, you'll be ready to start harvesting fresh herb leaves in just a few weeks. Once you have a general ideal of the plants you want to grow, it's time to start thinking about containers. Ask yourself if you want to grow everything in one large container or if you'd prefer to have several smaller pots. A collection of smaller pots can be ideal if you plan on growing the herbs indoors from the start or if you think you'll bring them indoors to continue to grow through the winter. Once the soil and plants are in place, it'll be difficult to lug a big container into and out of your home. There are a few things you want to look for in your containers. Size matters, for one thing. Your herbs will need plenty of room for their roots. Although some plants prefer cramped containers, in the case of herbs, it's usually better to err on the side of a too big pot, rather than a too small pot, according to Burpee. The other important thing to look for is a drainage hole. According to the University of Illinois Extension, you can put herbs in a container made of any type of material and in any shape, so long as it has a drainage hole. Although most containers will have a hole already, you can drill one into a pot if you really like it and it doesn't have any drainage. Even if you plan on growing perennial herbs, which can survive a bit of cold and frost, it's best to wait until after the last frost in your area before planting your herbs outdoors. When you plant them in containers, fill the pot about two thirds of the way full with container mix. Loosen the root ball of the herbs and gently place on top of the soil. Fill in the rest of the pot with soil, planting the herbs level with the container mix. Don't bury their stems. Most herbs need full sunlight, at least six hours a day, to really thrive. Some varieties, such as basil and parsley, can tolerate part shade, especially in the heat of the summer. But most are happiest when they get a lot of sun.. If you're growing your herbs outdoors, find the sunniest spot on your patio or in your yard to put the containers. When it comes to watering your herbs, pay attention to their specific moisture needs. 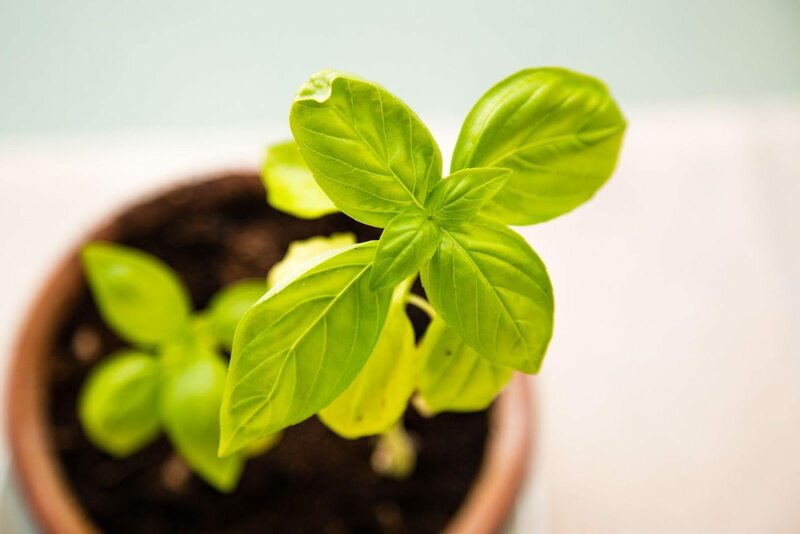 Plants that like moist conditions, like basil, should be watered almost daily, as their soil dries out. You can let more drought tolerant herbs, like rosemary, dry out a bit more between waterings. Pay attention to your herbs, as they'll let you know if they're getting enough, too much or too little water. Underwatered plants will droop while over water herbs will develop yellowed leaves. Pruning your herbs regularly not only encourages new growth. It also allows you to harvest and enjoy your plants. When you harvest the plant's leaves, don't just pluck them off like the petals on a flower. Instead, cut the stems, just above a pair of leaves. Doing so will allow the plant to produce new leaves and stems.